Samstanling Monastery, Sumur, Nubra Valley, J&K, India – When His Holiness the Dalai Lama arrived at the teaching ground set in a hillside orchard below Samstanling Monastery this morning, young monks were engaged in intense debate before the throne. He greeted a packed audience estimated to number 6000: “Once again we’re able to gather in this delightfully shaded garden. With us is the incomparable Ganden Trisur Rinpoche, who when he occupied the Ganden Throne, when he was Abbot of Drepung and when he was Abbot of Gyumey Tratsang, the Lower Tantric College, worked tirelessly to improve the education of the monks under his care. I’d like to thank him. “The Heart Sutra we have just recited is also known as the Perfection of Wisdom Sutra in Twenty-five Lines. The Perfection of Wisdom Sutras are the principal teachings of the Buddha. Maitreya’s ‘Ornament for Clear Realization’ explains their implicit content, which is why I like to repeat the verse of salutation from it. Nagarjuna’s ‘Fundamental Wisdom’ explains the explicit content and I like to repeat the verse of salutation from that too. “Over the last 3000 years or so, religions have emerged as a response to the problems and challenges people face. They are a source of hope. Philosophical views to support these may have begun in India with the Samkhya School. About 2600 years ago, Buddha Shakyamuni appeared. He mastered the prevailing traditions for developing concentration, but discovering that the problems we face derive from our misconception of self, from the start he taught selflessness. “In most of our temples and monasteries we keep the Kangyur and Tengyur collections-the translated words of the Buddha and the translated explanatory treaties composed mostly by Indian masters as a result of their analysis. “The Tibetan Emperor Songtsen Gampo first took serious interest in Buddhism, but it was due to the efforts of a later trio, the King, Abbot and Adept-Trisong Detsen, Shantarakshita and Padmasambhava-that Buddhism became rooted in Tibet. Subsequently, Tibetan masters contributed another 20,000 commentaries on Buddhist thought and in so doing contributed to keeping the tradition alive. There are four major Buddhist philosophical schools and texts propounding their ideas are translated into Tibetan. In fact, the entire teaching of the Buddha is most extensively available in Tibetan. “This complete teaching of the Buddha spread north to Mongolia, which is now divided into Inner and Outer Mongolia, and is related to the Russian republics of Buryatia, Kalmykia and Tuva. It has also spread throughout the Himalayan Region. For more than 1000 years we have kept this tradition alive. Over the several days in the Nubra Valley His Holiness has taught in Tibetan, occasionally lapsing into English, but his words have been gently and steadily translated into Ladakhi dialect by Dr Lobsang Tsewang. Not infrequently His Holiness will give an extensive explanation that he then encourages Dr Lobsang to summarize. 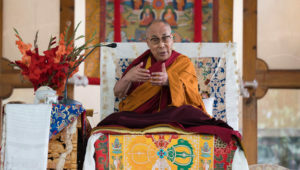 Harking back to Tibetans’ early days in exile, His Holiness reported how he had encouraged institutions like Namgyal Monastery, Gyumey and Gyutö Tantric Colleges that had previously concerned themselves largely with tantric rituals to introduce programs of philosophical study. Similarly, although there had been no recent custom of nuns studying the classic texts in Tibet, he encouraged nunneries too to introduce study programs. A direct result of this was that last winter twenty nuns were awarded Geshe-ma degrees, acknowledging their more than 20 years of rigorous study. “Today’s teaching is a text by the great master and manifestation of Manjushri, Je Tsongkhapa, whose collected writings comprise 18 volumes,” His Holiness observed. “His elucidation of both philosophy and tantra was such that when he declared his own teacher Rendawa the ‘crown jewel of scholar in Tibet’, Rendawa returned the compliment saying it was more appropriate to him. His reading of the Indian classics was thorough and his analysis of them remarkable. He was able to consult Manjushri initially through the visions of his teacher Lama Umapa and later developed his own visions. It was Manjushri who told him that Rendawa would be the best person to teach him the Madhyamaka view, advising that what the teacher could not explain he could discover by reading the Indian treatises. “He had his first vision of Manjushri in retreat, in the course of which he was given a terse explanation of emptiness that he found hard to understand. Manjushri advised him to do practices that would clear defilements and accumulate merit, so he went into retreat again to do so. He also had a vision of the five masters of Madhyamaka-Nagarjuna, Aryadeva, Buddhapalita, Bhavaviveka and Chandrakirti. From amongst them, Buddhapalita, who he noticed had a bluish, dark complexion, came forward and touched the book he carrying to Tsongkhapa’s head. 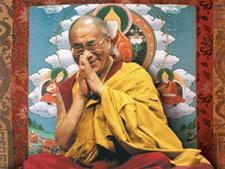 Subsequently, he acquired and read the treatise known as Buddhapalita and gained an insight into emptiness. “When I was small, I was able to memorize this ‘In Praise of Dependent Origination’ in one morning. Later, I asked the monks of Namgyal Monastery to memorize it too. It is a text that bears the blessings of the hard work Tsongkhapa put into understanding emptiness. I received the transmission of it from the Kinnauri Lama, Gyen Rigzin Tenpa, who in turn had heard it from Khangsar Rinpoche. His Holiness concluded with the clarification that he had given this reading of ‘In Praise of Dependent Origination’ because his own teacher, Ganden Trisur, Rizong Rinpoche had requested him to. Seeing children from the Lamdon School in the audience His Holiness gave a transmission of the Praise to Manjushri known in Tibetan as Gangloma. He told them that as a child he used to recite it three times daily and asked to do so too. He followed this with the transmission of Manjushri’s Ara patsa nadhi mantra.